Neuroinflammation is now recognized to be a feature of many neurological disorders. More accumulated evidences suggested chrysin which was contained in honey, propolis, vegetables, fruits and plants can exert biological activities including anti-neuroinflammatory effects. However, the precise molecular mechanisms of anti-neuroinflammatory effects remain unclear. In the present study, we explored a novel molecular mechanism involved in the anti-neuroinflammatory effect of chrysin. Firstly, we investigated the anti-neuroinflammatory effects of chrysin in LPS-induced BV2, primary microglial cells and mice. Next, we found chrysin can inhibit NF-κB pathway and TRAF6 expression, but upregulate the expression of zinc-finger protein A20. Further studies have revealed upregulation of A20 can regulate the inhibitory effects of chrysin on NF-κB pathways via regulation of TRAF6 polyubiquitination. 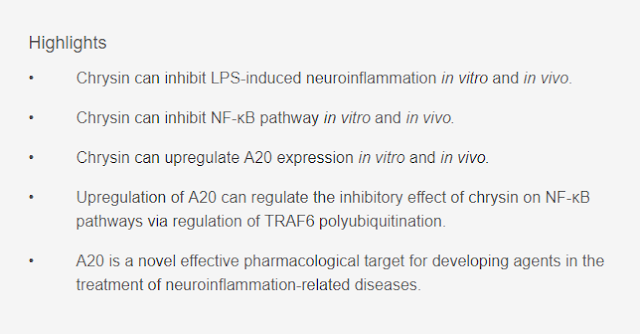 This present study demonstrates that chrysin exerts an anti-neuroinflammatory effect via a novel mechanism, the upregulation of A20 expression, also validates A20 is a novel effective pharmacological target for developing agents in the treatment of neuroinflammation-related diseases.